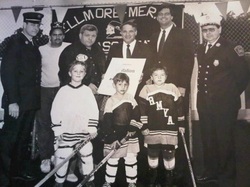 The BMRH Alumni Association is working to help the Bellmore Merrick Roller Hockey League, which has served as communities of Bellmore and Merrick for over 25 years. The Alumni Association coordinates the Annual Alumni Game and Reunion to increase awareness and support of the Bellmore Merrick Roller Hockey League. Our goal is to raise funds for the development and longevity of the BMRH League. Money raised through donations and sponsorship will benefit current players, the league, help children whose families cannot afford the registration and equipment costs associated with hockey. The Annual Alumni Game and Festivities will take place in May 2013. A date has not been scheduled as we await the availability of hockey rink and surrounding grounds from the league and neighboring business. We are currently accepting support and sponsorship from local companies. Your personal or corporate contribution to the event will go a long way in making the Alumni Game & Festivities, as well as other various BMRH League events, a grand success. Please click the link below to make a contribution. There is no amount too small and you will be greatly rewarded in knowing that your donation is going to a great cause! If you would like to sponsor an event, we will include your logo or business name on publicity materials including fliers, programs, tee shirts, signage, and any other literature that we are distributing to 100+ participants and spectators. Call for pricing on printed banners, boosters and signage or for other advertising or vending opportunities. I would like to thank you for considering our request to team up with our organization for raising funds. If you have any inquiries regarding our organization or the event, please feel free to contact us at BMRHALUMNI@gmail.com. Thank you.